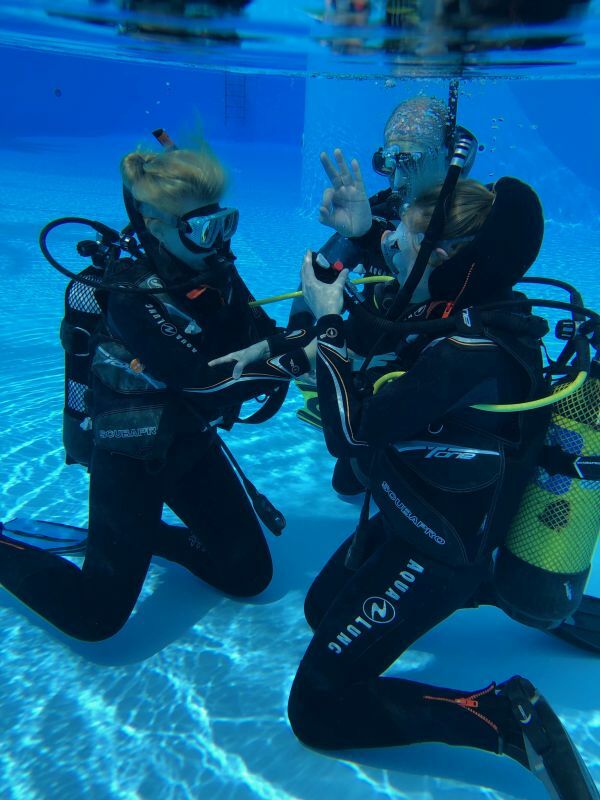 The PADI Open Water Diver (OWD) is a beginner course that concludes with an international diving license. 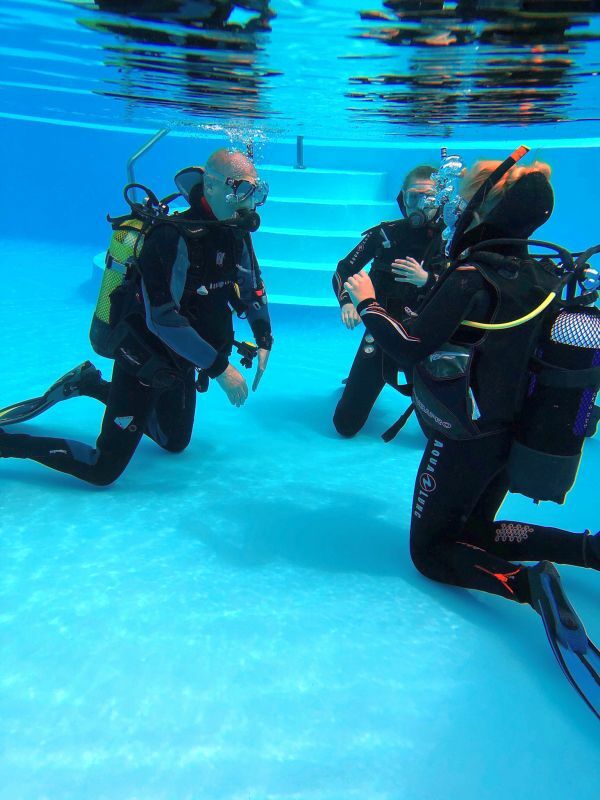 The course consists of 5 theory modules, practice in the pool and 4 open water dives. In the final exam you will have to answer 50 questions and you will pass with 75% correct answers. 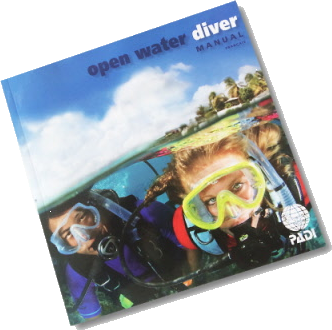 The PADI Open Water Diver manual, divers logbook, rental of equipment and divers insurance during the course is included in the price. 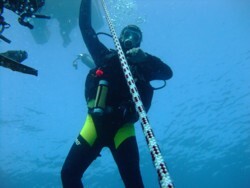 The PADI license fee has to paid seperately upon completion of the course. Minimum 3 complete days, usually this is time enough to pass all the practices and exams. If you are having problems the course may last longer. Courses start Mondays and Thursdays all year round. Open Water TOUCH - Start your course NOW! Fill in our Online Registration and select the PADI Open Water Touch option. With PADI Open Water Touch you may start your theory right now at home on your tablet, notebook or PC. All presentations, videos, manual, quizzes and the final exam are included in the Open Water Touch App. 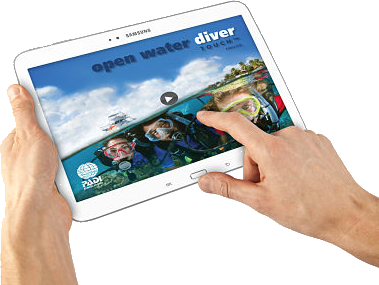 The PADI Open Water Diver Touch App is available for Apple and Android tablets as well as for PC. 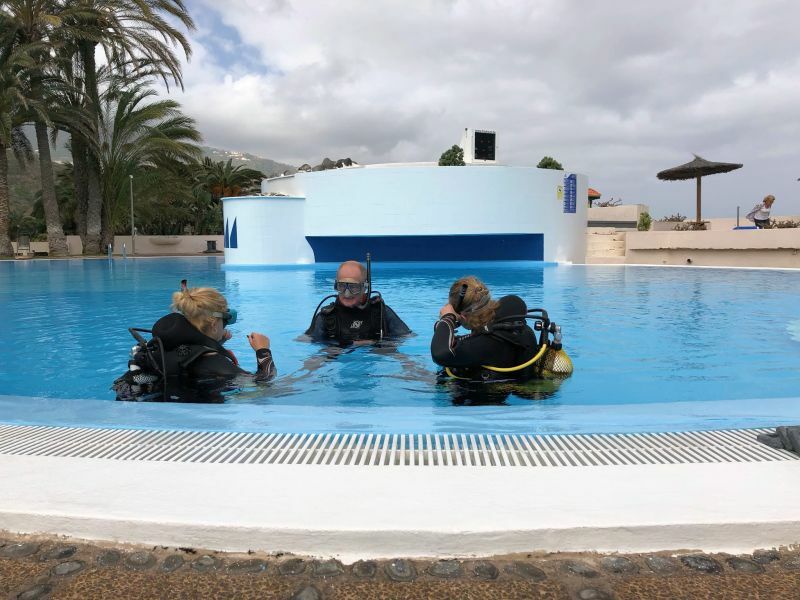 After finishing the theory at home you will only need to attend the practical part of the course during your vacation here in Tenerife and you may enter directly the pool and the sea with your instructor upon arrival. The App will be functioning OFFLINE on tablet computers, you'll need internet access only for the download of the app and for transmitting your exam results upon successful completion of the theory. On notebooks and PC the app is working online at all times. You will receive the PADI Open Water online manual for free together with your Touch-App. The price of the PADI Open Water Touch App is 135 € per participant! The online learning software can't be shared with other participants as your download code is connected to your license code and fee. You may pay by bank transfer, Paypal or credit card. 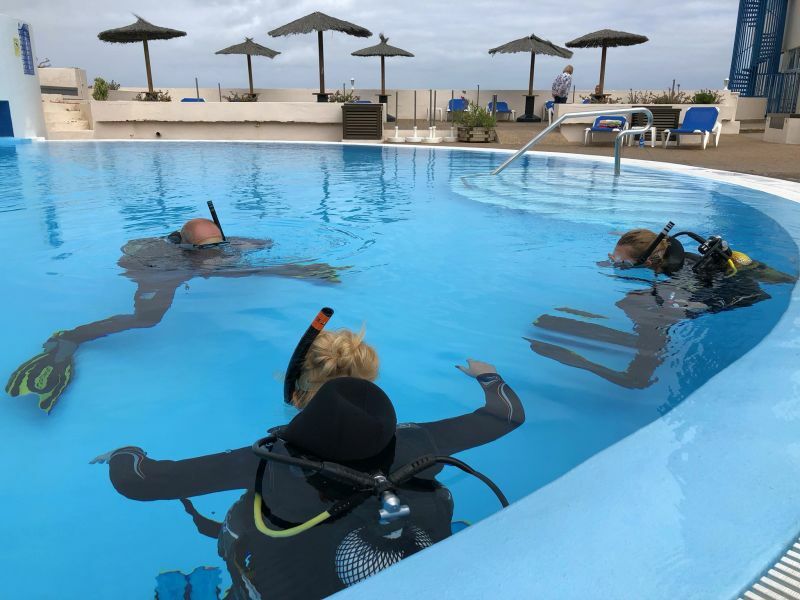 The PADI license fee of 45 € is already included in the price for the app, therefore this option is 40 € less than the classic option with manual and classroom lessons. Here in Tenerife you'll need to attend the PADI Open Water Diver course for online students. Get special ANNIVERSARY DISCOUNT of 50€ - book online at least 2 weeks in advance! Enrole online at least 14 days in advance and get 50€ anniversary discount on practical part of the course! We will meet under water soon! You may also book your PADI Open Water Diver course as classic course with classroom instructions here in place. Your manual you may receive in paper form here at the dive centre or as online manual right now. Choose the option which suits you best in our online reservation. Open Water Manual - as manual in paperform or as online manual. 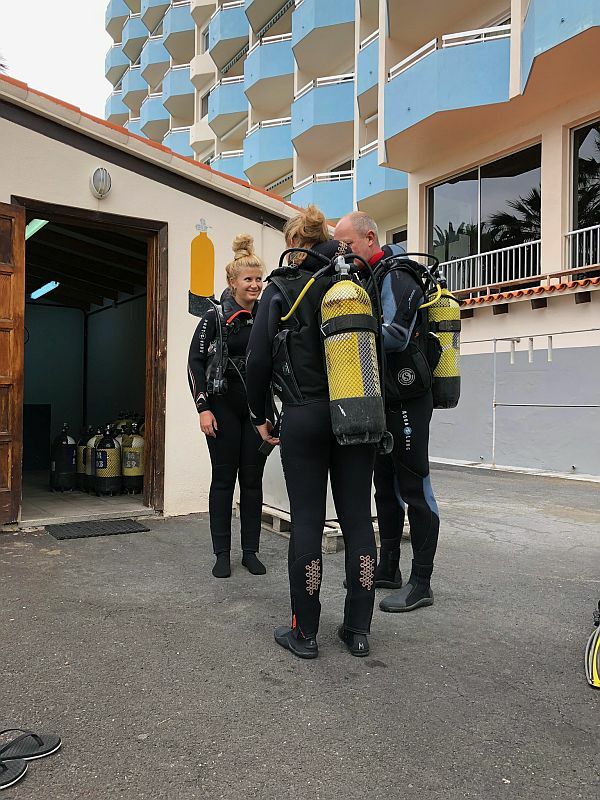 In case you have already started your PADI Open Water Diver course on another dive centre and you wish to finish it here with us, you may do so getting a "PADI Referral" from your actual instructor. This option has been designed for students who like to start their course at home, doing all the course theory and pool practises in their hometown or nearby, but who feel that scuba diving in cold lakes of your country or in the north sea or the baltic sea is just not yours. Let your PADI Instructor fill out a "Referral" where he will sign all finished skills, practises and course parts. We will continue with you exactly where you stopped here in the warm and nice waters of Tenerife. This option is available only within 12 months since the referral. After one year the already finished course parts can not be taken into consideration anymore, you will have to reapeat the full course. 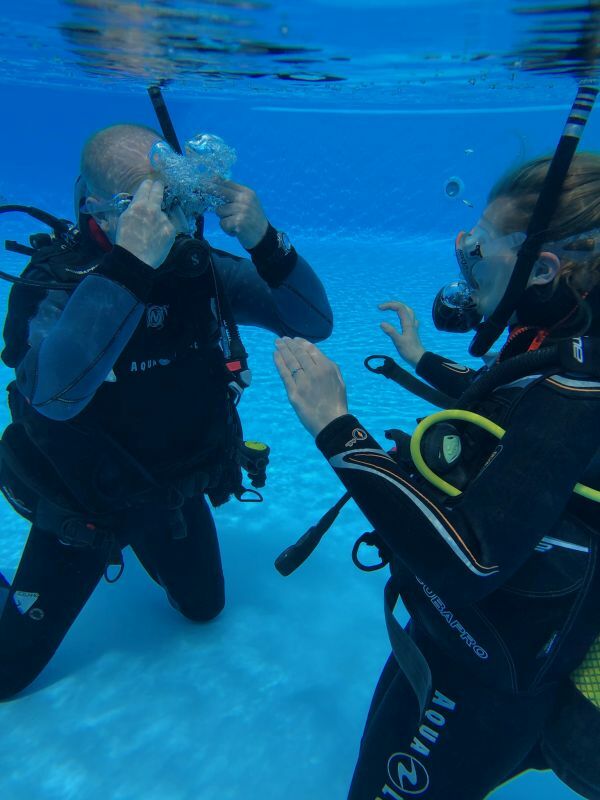 The price for a Referral Open Water Diver course depends on the still missing elements of the course. Please send us a copy of your referral to get an individual free quote. You are already PADI Scuba Diver! In this case you will only need an Upgrade to PADI Open Water Diver. We can offer you the PADI Open Water Diver Upgrade for 295 €. 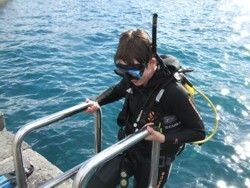 Price of course includes complete rental equipment and diving insurance. 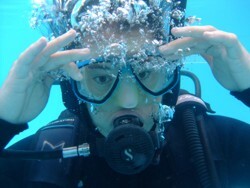 The PADI license fee of 45 € is included in this course. Pre-Requisite for an upgrade is that the PADI Scuba Diver has been finished within the last 12 months. After more than one year you need to participate in the full course to become PADI Open Water Diver.